Each passenger needs a farecard to enter and exit. Up to two children under age five may travel free with a paying customer. Fares are based on when and how far you ride. Station-to-station fares are located on station manager kiosks and FARECARDS & PASSES machines. The machines accept credit and debit cards. If you use cash, bring small bills; the machines only provide up to $10 in change (in coins). Save money by using a SmarTrip® card instead of a paper farecard. SmarTrip® is a plastic farecard that can be reloaded with value and reused to pay Metrorail and Metrobus fares and parking fees at Metro-operated lots. SmarTrip® cards are sold from dispensing machines at Metrorail stations. 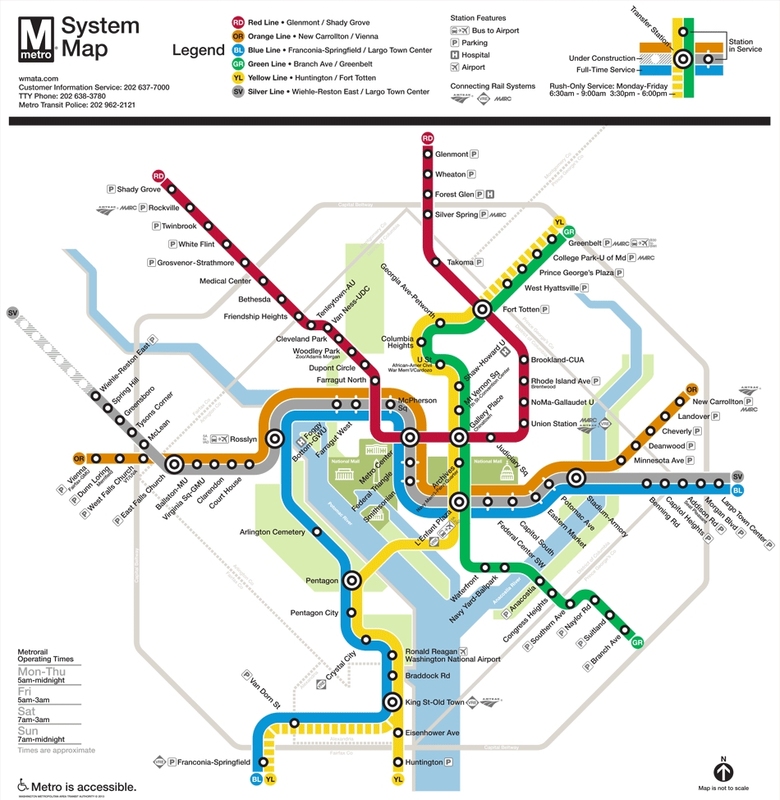 You can also buy a SmarTrip® card at over 200 retail locations or online at wmata.com. You can add value to your SmarTrip® card at FARECARDS & PASSES machines in Metrorail stations, at select retail locations and on our website. You can also check your registered card’s value, see where and when you used it last or report it lost or stolen on our website. If you plan to ride a lot in one day, get one day of unlimited Metrorail rides with a One Day Pass. Buy it from a FARECARDS & PASSES machine in Metro stations. SmarTrip® card dispensers are available at all Metrorail stations. The dispensers sell SmarTrip® cards for $10: $2 for the card itself and $8 in fare value. The dispenser accepts all major credit and debit cards and $1, $5, and $10 bills. It does not give change. The blue "Passes/Farecards" machines accept cash and major credit and debit cards, and sell single or multiple farecards and passes: the One Day Pass and Fast Pass. You can also add value to your SmarTrip® card, including One-Day Passes, Short Trip Pass, and Fast Passes. The black "Farecards" machines sell single farecards and can be used to add value to SmarTrip® cards. They only accept cash. Bills up to $20 are accepted. The machines provide up to $10 in change. The brown "Exitfare" machines are located near the Metrorail exit gates and only accept cash (coins and $1, $5 and $10 bills). If you were prevented from exiting because your farecard had insufficient fare, then follow the instructions on an Exitfare machine to add the remaining fare. Navy Yard-Ballpark - Access to Nationals Park - the home of the Major League Baseball Washington Nationals. Stadium-Armory - Easy access to the Opening Ceremony at Robert F. Kennedy Memorial Stadium in Washington, D.C.
Smithsonian - One of the best stops to see most of the major monuments and museums in Washington, D.C. The Mall entrance closes at 10:00 p.m. daily. Open: 5 a.m. Mon.-Fri. 7 a.m. Sat.-Sun. Last train times vary. To avoid missing the last train, please check the last train times posted in stations.